Mobilize the Workers To Crush the Coup Plotters! Urgent: Protest Bloody Repression in Honduras! Opponents of the Honduran dictatorship dispersed by tear gas in police attack on demonstrators outside the Brazilian embassy in Tegucigalpa on the morning of September 22. Yesterday, September 21, President Manuel Zelaya Rosales returned to Honduras, 86 days after he was ousted in a civilian-military coup, kidnapped from his home at gunpoint and expelled from the country. The de facto regime installed by the coup plotters, headed by the puppet “president” Roberto Micheletti, was evidently caught by surprise by Zelaya’s return. Hundreds of opponents of the coup rushed to the Brazilian embassy where he is staying in order to greet him and to form a human barrier against the military. The regime declared a 24 hour curfew, to which the population paid no heed. 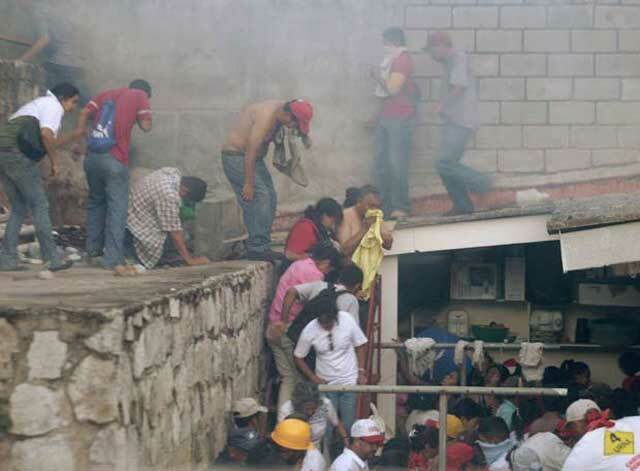 Radio Liberada in Tegucigalpa reported at 10 a.m. local time that a football stadium and baseball stadium next door are being used as jails, and people are being tortured there. The radio recalled the use of the National Stadium in Santiago, Chile as a concentration camp and torture center during the Pinochet coup of 11 September 1973. Radio Globo, also in Tegucigalpa, reports that the area around the Brazilian embassy is basically deserted, with military and police sharpshooters posted on the surrounding rooftops with orders to shoot to kill if Zelaya should come out. Elsewhere in the city, many explosions have been heard near the airport. Radio stations in San Pedro Sula and El Progreso have been seized by the military. The working people, peasants, indigenous and garífuna populations of Honduras have courageously resisted the coup plotters from the beginning. Teachers immediately went on strike, which has continued to this day, and two striking teachers were assassinated. Unions have led the resistance, calling two national work stoppages at the end of July and again in August. Hundreds of thousands have demonstrated in Tegucigalpa in opposition to the dictatorship and demanding the return of Zelaya. But Radio Globo reports that among those demonstrating outside the Brazilian embassy, Zelaya’s call for “dialogue” with the coup plotters was not popular. The Organization of American States hailed Zelaya’s “courageous act,” while U.S. secretary of state Hillary Clinton called for the usurpers and Zelaya to “find common ground.” This tacit recognition of the coup regime has characterized U.S. policy ever since June 28. In fact, high State Department officials were up to their necks in discussions with the plotters before the coup on how to “legally” oust Zelaya, due to his ties to Washington’s nemesis, Venezuelan leader Hugo Chávez. This is the policy of the entire U.S. government, of President Barack Obama. We call for urgent international solidarity with the Honduran working people resisting the coup and denunciation of U.S. support for the plotters. For a general strike and workers self-defense against the repression! Yankee imperialism, go to hell! No phony “dialogue” with the assassins – For workers action to crush the coup plotters! Fight for a workers and peasants government, in a Central American Federation of workers republics!